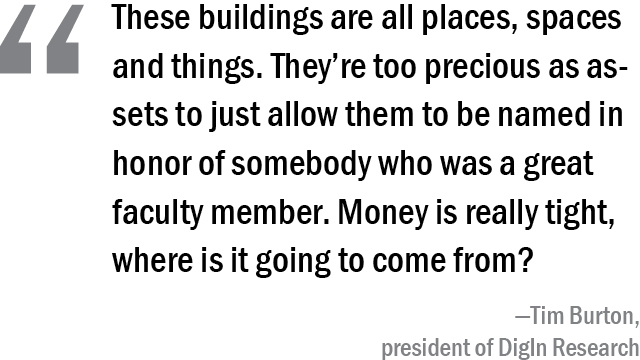 The names of oilmen and CEOs are making their way onto campus buildings as UT becomes more likely to honor big-dollar donors instead of long-time professors and influential University presidents. While UT currently has more buildings named in honor of faculty members, examining the history behind more than 80 buildings on campus reveals that in the past 13 years, the University has more frequently named buildings after individuals who have donated large sums of money to the campus. 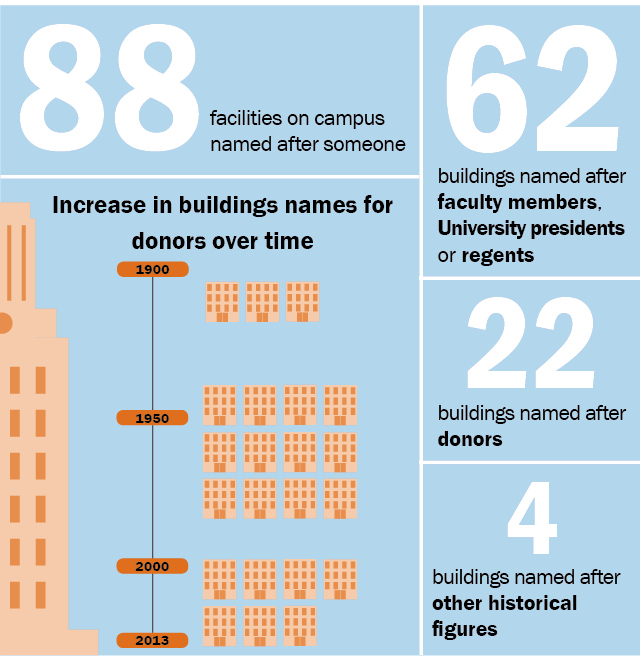 The practice of naming buildings after donors has become more common as state allocations to UT decreased drastically in the last two decades making the University more dependent on philanthropy. Seven of the 12 buildings named since 2000 were named in honor of donors rather than University presidents or faculty members. Almost all of the buildings named in honor of donors were built in the second half of the University’s 130-year history. This includes the Gates-Dell Computer Science Complex — the latest building on campus to be named for donors. The Gates-Dell Complex replaced Taylor Hall, which was named after Thomas U. Taylor, who was UT’s first engineering dean and fought against a University president who wanted to dismantle the engineering department. It’s a practice that’s become more common nationally, as the cost of higher education has increased, according to UT historian Jim Nicar. There are 88 named buildings on campus — 22 of which were named after donors. Orange — A building named after a UT president, faculty member or regent. Green — A building named after a donor. Yellow — A building that is unnamed. The University might name the building in the future, however. Purple — The UT Tower and Main Building. Light Blue — A building named after someone who is neither a former UT president, faculty member of regent or a donor. Using building names as a gift-giving incentive is a common practice for the University and other non-profit institutions, according to Brian Willey, an assistant director of the University Development Office who handles the naming of buildings. “Many donors like to have their names attached to projects that they are passionate about, and institutions are happy to recognize these high-level gifts with namings,” Willey said. Willey said the process of naming a building typically begins in the offices of the college deans, who are responsible for fundraising. John Halton, an associate dean of engineering, said the Cockrell School of Engineering is using naming opportunities as a fundraising mechanism because more than $100 million of the building’s construction cost is expected to come from philanthropic efforts. The Cockrell School of Engineering provides potential donors with an online listing of 70 naming opportunities corresponding with price tags for the still-to-be-built $330 million Engineering Education and Research Center. The name for the new building is paired with a $60-million donation. While the University uses building names as a gift incentive for philanthropists, some donors throughout UT’s history have chosen to remain anonymous. It was not until this past February that after years of urging and encouragement from UT, prominent donors Peter and Edith O’Donnell decided to shred their anonymity and allow the University to name the Applied Computational Engineering and Sciences Building after their family, which has given more than $135 million since 1983. In 1890, the Board of Regents urged a reluctant George W. Brackenridge, UT’s first big donor, to allow the University to name its first dorm, B. Hall, after him when he paid for its construction, hoping it might attract another donor, Nicar said. Some unnamed buildings are a result of unsuccessful naming campaigns. In lieu of donations, the University often names buildings in honor of renowned faculty members or presidents. UT has named 23 buildings that previously went unnamed, including Anna Hiss Gymnasium and Mezes Hall, years — sometimes decades — after they were built. Other Universities made the shift to naming more buildings after donors long before UT did, according to Tim Burton of DigIn Research, a company that specializes in helping nonprofits fundraise and setting asking-prices for building names. Burton said as money gets tight, nonprofit institutions become more conscious of the potential to raise money by naming their facilities in honor of donors. Other universities, such as the University of Florida, a former client of Burton and a large public institution similar to UT, have named a higher percentage of their buildings in honor of donors. UT might catch up though, as it is on the verge of beginning a new construction phase that could largely be funded by donors. In addition to the engineering building, the University is also set to construct as many as 10 new buildings in the next decade as part of the Dell Medical School, which was named in honor of the Dell Foundation after it donated $50 million. Nicar said UT is not necessarily turning its back on its history as it names more buildings after donors and less after historical faculty members. “There are other ways that we are remembering our history,” Nicar said. Recently, the University has taken to naming areas within buildings. Last year, UT dedicated the ground floor atrium in the Student Activity Center to Margaret Berry, a prominent UT alumna, lecturer and historian. UT also named a room in the Engineering Teaching Center II after Thomas Taylor, UT’s first engineering dean whose previous building was replaced by the Gates-Dell Complex. Although, Nicar said he would like to see Taylor’s name return to campus on another building.